Dr. Crosby graduated with honors from Duke University. She earned an NIH-funded scholarship to the Medical University of South Carolina in Charleston, where she completed medical and graduate school training. She earned a PhD in molecular and cellular patho-biology (with focus on inflammation and rheumatology). She applied that knowledge to research on ocular inflammation during clinical training. This was a turning point in Dr. Crosby’s career. As she worked with patients suffering sight-threatening conditions, she developed an uncommon drive to restore and enhance vision. Throughout her educational background, Dr. Crosby received many awards, including election into the prestigious Alpha Omega Alpha medical honor society. Following internship at Harbor-UCLA, Dr. Crosby completed residency at Emory University in Atlanta, GA.
Dr. Crosby is a strong patient advocate, committed to delivering the highest level of care even in challenging settings. 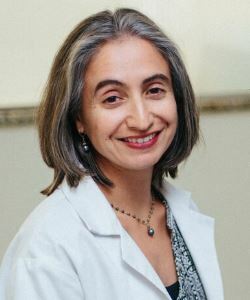 She served as a liaison between medical specialists, promoting diabetes management and eye care for underserved patients in Atlanta, and set up numerous vision-screenings and health fairs during those busy training years. She continues to volunteer her time monthly at Father Joe’s Village Clinic in downtown San Diego. One of Dr. Crosby’s favorite aspects of comprehensive ophthalmology is listening to patients’ concerns, and educating them on vision conditions. Recognized as a gifted teacher, she eagerly shares knowledge with patients, and future ophthalmologists. She is an Assistant Clinical Professor in the Department of Ophthalmology at UCSD. Her research is extensively published, and Dr. Crosby has presented at national and international meetings on topics of inflammation, eye disease, and uveal melanoma. She maintains contact with emerging companies and research groups to stay abreast of innovative treatments for corneal disease and uveal melanoma. The doctor grew up in North San Diego County. She is pleased to return to those roots, serving friends and neighbors with the highest quality medical eye care in Southern California.